Three distinct groups of the parasite which causes malaria have been found in new drug-resistant forms, scientists say. Genetically different parasites were identified in Cambodia, which were found to survive treatment by the common drug artemisinin. It is a stark reminder of the importance of having medical travel insurance. Resistance to the drug was reported back in 2008 in the western area of the country and instances have since spread to other parts of south-east Asia. Parasites in the region have developed resistance to anti-malaria drugs since the 1950s and scientists have never been able to establish why this is the case. The worry now is that the same thing happens with artemisinin. Scientists recently sequenced the genomes of 800 Plasmodium falciparum (parasites which cause the disease) found around the planet. 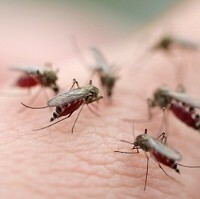 They say they discovered three groups of parasites in the south-east Asia region which withstand anti-malaria drugs. Lead researcher Olivo Miotto, who works at both Oxford University and Mahidol University in Thailand, said: "All the most effective drugs that we have had in the last few decades have been one by one rendered useless by the remarkable ability of this parasite to mutate and develop resistance. Artemisinin right now works very well. It is the best weapon we have against the disease and we need to keep it." The research was published in the journal Nature Genetics.